Qumran, where the Dead Sea scrolls were found, bears unmistakable evidence of major earthquake destruction in 31BC during the reign of Herod the Great where 10,000 people lost their lives (Josephus). Photo shows staircase to mikve (ritual bath) damaged by seismic activity. When Jesus died on the cross, the end of his life was punctuated by a severe earthquake, following a strange three-hour darkness covering the land (Matt. 27:50-54) and a second great earthquake occurred on Easter morning at the time of the resurrection (Matt. 28:2). Researchers know that there was an earthquake on April 11, 33CE making it a possible date for the crucifixion. The prevalence of earthquakes during the Second Temple period caused the High Priest when he went into the Holy of Holies on Yom Kippur to include in his prayer a special intention (kavana) that the people who lived on the Sharon plain (a populated area to this day) should be spared the fate of “having their houses become their graves” (Yoma 5b). A powerful earthquake (7.0 on Richter scale) in 363CE, which caused widespread havoc throughout ancient Israel, destroyed Antipatris (Tel Afek) and Tzippori. 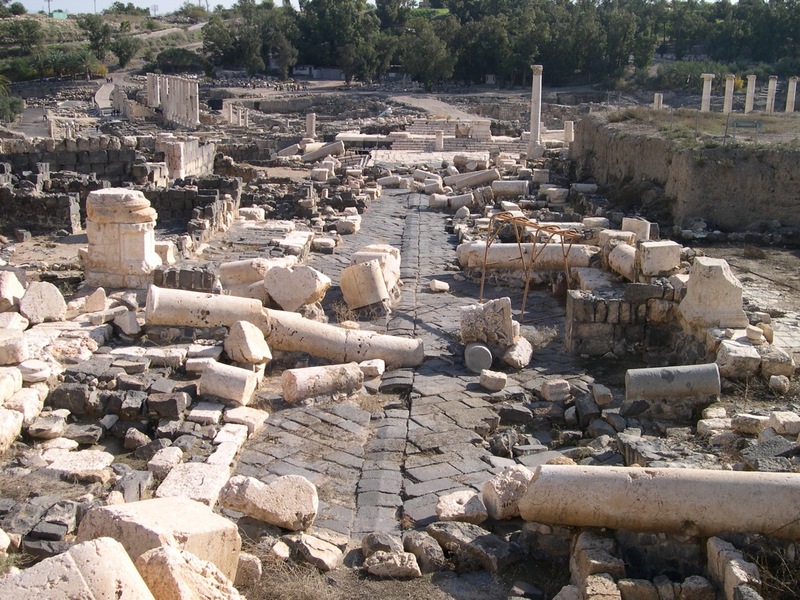 Bet Shean, one of the major Roman cities known from Hellenistic times as Scythopolis, suffered major damage in 363CE and was devastated in the Golan earthquake (6.6 on Richter scale) on January 18, 749CE and never recovered. Photo from the archaeological site at Bet Shean shows toppled columns in a row along the Decumanus, think of a tablecloth jerked under wine bottles. Also on the northeastern side of the Sea of Galilee the other Decapolis city of Sussita and the nearby monastery at Kursi were destroyed and abandoned. Jerusalem suffered a severe earthquake (6.7 on Richter scale) January 15, 1546: the dome on the Church of the Holy Sepulcher was completely destroyed as were many other buildings. The Dome of the Rock was seriously damaged; the Al-Aqsa Mosque was damaged or destroyed in 749CE, 1033CE, 1546CE and in the 1927 earthquake. The three most destructive earthquakes in Israel since the 18th century happened in 1759, 1837 and 1927. Check out my article about the Nimrod fortress to see a photo of the result of earthquake activity. On January 1, 1837 at 2pm an earthquake “obliterated” Safed, Tiberias and damaged neighboring Arab villages causing more than 5,000 fatalities. Another major quake (6.4 on Richter) occurred on July 11, 1927 at about 16:00 local time. The epicenter of the earthquake was on the western shore of the Dead Sea (31.6, 35.4) just north of Metsoke Dragot. Besides Jerusalem, the cities of Ramle, Tiberias and Nablus were heavily damaged and at least 500 people died. 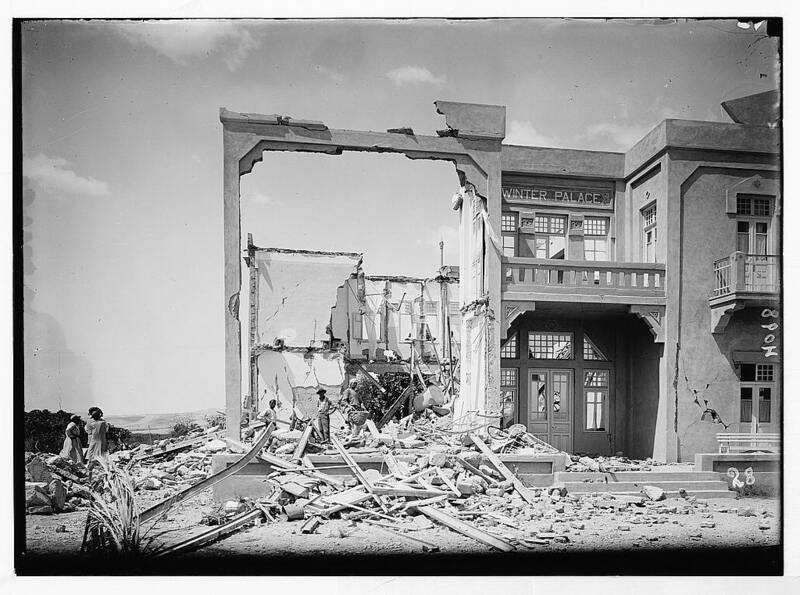 In Jericho, a number of houses collapsed, including several relatively new hotels. In addition, the Allenby Bridge collapsed and the Jordan river was blocked for about 21 hours following the collapse of the marl cliffs on its banks. The last major earthquake to hit Israel was 1927 and on average, there is an earthquake approximately every 80 years. That and the large amount of unrelieved stress (~10 meters) along the African Rift today tells scientists that we are overdue for a major earthquake. This entry was posted in Archaeology, Jerusalem, Nature and tagged African Rift, continental plates, earthquakes, Jerusalem earthquake, postaweek2011, Tzfat, Tzfat earthquake on January 10, 2011 by Shmuel Browns. I was wondering about what you said in your blog about earthquakes– you mention that researchers know that there was an earthquake in 33 AD– where are you getting this information? I was just curious. I was thinking about traveling to Israel in the near future and you were recommended. Earthquakes leave behind evidence that archaeologists and geologists can uncover. For example, the Israel Exploration Journal published by the institute of archeology at the Hebrew University published an article “Earthquakes in Israel and Adjacent Areas: Macrosismic Observations since 100 BCE.” On page 265 they list a slight earthquake in Jerusalem in AD 30 and one in AD 33 which affected Judea, Jerusalem including damage to the temple. Full reference is D.H.K. Amiran; E. Arieh; Turcotte, “Earthquakes in Israel and Adjacent Areas: Macrosismic Observations since 100 BCE,” Israel Exploration Journal 44 (1994):260-305. “Two thousand years ago the Dead Sea Basin was shaken by two earthquakes that left two widespread seismites within laminated Dead Sea sediment. The first earthquake (spring 31 B.C., Jericho fault, M~7.2) transformed adjacent Dead Sea laminated mud and aragonite into a persistent and distinctive intraclast breccia seismite in places greater than 1 m thick. The 1st- century Jewish historian Josephus described the 31 B.C. earthquake as a significant social and economic event during King Herod’s reign. A second seismite occurs within laminated mud and aragonite at 10 to 85 cm above the 31 B.C. seismite. Varve counting above the 31 B.C. datum indicates the second seismite can be assigned to 31 A.D. (+/- 5 years), but history specifies as 33 A.D. Superb mud laminae exposures are provided in two gullies at the southwest corner of the Dead Sea at Wadi Ze’elim fan delta where the 33 A.D. seismite outcrops 55 to 85 cm above the 31 B.C. intraclast breccia.” Reference Steven Austin, “Jerusalem Earthquake of 33 AD Evidence within Laminated Mud of the Dead Sea, Israel”, Geological Society of America, Nov. 2012.